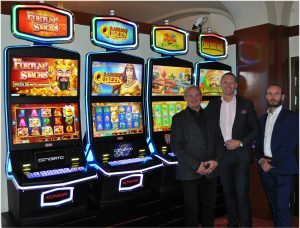 Konami Gaming, Inc. announced the arrival of its leading new Concerto video slot machines at Sweden’s Casino Cosmopol. Sweden’s state-owned gaming entity Casino Cosmopol operates four casino properties, of which its Stockholm and Göteborg locations now feature Konami’s Concerto™. The agreement was acquired earlier this year through Konami’s exclusive distributor for the region, ICM Casino Management AB (ICM). Top-performing debut themes such as Chili Chili Fire™, Dragon’s Law Twin Fever™, and Radiant Queen™ have brought exciting new bonus events, game mechanics, and special features for players at Casino Cosmopol to experience for the first time.